"He was a harness-maker at a factory in Maynard, but let's face it, harness factories only last so long." Mary and Henry Fishman, c. 1940. My father came to the United States in the early 1900s when he was about 17. I think his family came through Ellis Island and then moved to Maynard. Some of the family came over and then they brought the rest of the family. My mother was his cousin, and they got married around 1907. They don't usually allow first cousins to marry in this country, you had to be a third cousin, but no one said anything, these were immigrants, who cared? They didn't have any trouble. He was a harness-maker at a factory in Maynard, but let's face it, harness factories only last so long. You've got to remember that they spoke only Yiddish and Russian. He could read and write Yiddish, and he learned to read English later on, but never learned to write it. 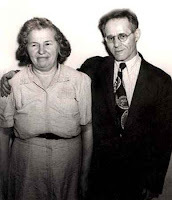 My mother spoke Yiddish and Russian and later English, and never learned to read or write. They call that illiterate! But she did know her figures, and when she went food shopping, boy, no one could cheat her. "They don't usually allow first cousins to marry in this country, you had to be a third cousin, but no one said anything, these were immigrants, who cared? They didn't have any trouble." "Milton was ten years after me. He's the baby of the family and he still acts like one." My older brothers and sisters were born in Maynard, and I was the first one born in Boston. I'm the seventh out of ten, and thank God they were speaking English by the time I was born. My two brothers--Uncle Abe and Uncle Ruby--quit school to support the family. But even though Reuben quit school later on he went to Bentley College, they accepted him even though he didn't have a diploma. 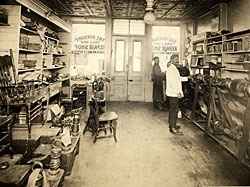 He had already been working a long time, he even had his own shoe store. 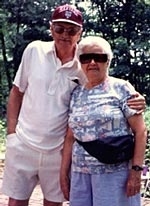 My oldest sister Rose got appendicitis when she was about 13, she was in my grandfather Aaron's care up in Maine. My family didn't believe in hospitals, they thought you only went to hospitals to die. The hospital wanted my grandfather to sign for the operation, but he wouldn't sign because he was afraid they would kill her. By the time they got my father it was too late and she died. Nowadays they operate whether you sign or not. Auntie Eva was the fourth child. She could speak only Yiddish, and one day the social workers came to my mother and said "she's of age, she has to go to school." So my mother took her by the hand and left her in the school yard! 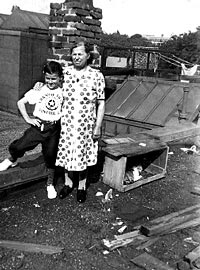 Milty and (his mother) Mary Fishman on the roof in Dorchester, c. 1939. Note the cat and the laundry. Eva just stood there, she didn't know what to do, she couldn't speak English. When the children went inside she stood there and one little child took her by the hand and brought her inside. The teacher sat her right in the front row and that's where she learned her English. Who was the first of us to learn English? I have news for you, it must have been Aunt Dora. Dora was next, but she had double pneumonia and the hospital took her away. There were so many children my mother couldn't take good of her. I never knew I had this sister until I was about 16 years old. She must have learned English when they took her away. The next one was Hyman, your Uncle Hymie, but I don't know if they spoke English then. All I know is that when I was around they were all speaking English. I used to hear them speaking Yiddish, I understood a lot of it, but I didn't speak it. If they didn't want us to know, they spoke Russian. Sarah came next, and then Uncle Phillip. Milton was ten years after me. He's the baby of the family and he still acts like one. "I never knew I had this sister until I was about 16 years old. She must have learned English when they took her away." We had two worlds. The house was the world of Jewish Orthodox family life, after school we would have Hebrew two hours a night at the shul. The men were the ones who were important, they were the ones who would say the prayers every morning. I liked learning Hebrew, so my father sent me. But it wasn't important for the girls. There were probably three girls out of thirty kids in the classroom. And of course the food was kosher. On a typical day, being a girl, I take my own breakfast, which was probably an egg and oatmeal and so forth, and I take my own lunch. The boys got served--my mother made their breakfast and their lunch for them. But for supper she served all of us, she always had a big meal, meat and potatoes and vegetables and sometimes fish and you had to eat every drop of it. On Saturday you didn't do anything, you couldn't even play ball. The boys went to shul, but the girls weren't expected to go. But on the holidays we would sit up in the balcony and we would look on the men down below, and frankly who would want to be down there saying all those prayers? The temples in those days they were big things, now they have smaller buildings. That's the Jewish side. That's one world. And the other world, we did live a mixed neighborhood, Italians and Irish and I think there was an Indian family, not from America but from India. Everybody played together, they were very friendly and they got along. This was the outside world. "The men were the ones who were important, they were the ones who would say the prayers every morning." "I even thought all the American holidays, like Bunker Hill Day, were Christian Holidays." 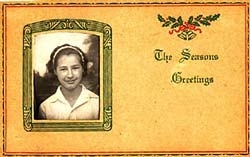 Holiday card featuring a picture of the narrator (Sylvia), c. 1935. School was the Christian world, the teachers were mostly Christian and unmarried. They were dedicated teachers, they were good. In the morning we saluted the flag and said the Psalm of David, but I figured because it wasn't in Hebrew it was a Christian prayer. Also the Jewish people say the last line one way and the Christians say it the other way. At Christmas time they sang songs, they weren't the ultra-religious carols, just Jingle Bells. But we knew these were Christian holidays. I even thought all the American holidays, like Bunker Hill Day, were Christian Holidays. For example, at Thanksgiving they said prayers--but technically it was an American holiday. There was a Jewish world and a Christian world, and let's face it, when you're younger that's all you know. "There was a Jewish world and a Christian world, and let's face it, when you're younger that's all you know." * I originally did this interview for a class on ethnicity and Modernism in 20th-century American literature (Spring 2001) with Professor Werner Sollors. The assignment was to think about what makes an autobiography "ethnic," (looking at this really interesting book The Life Stories of Undistinguished Americans), but I got somewhat off track and interviewed my grandmother over the phone for two hours. "I remember sleeping three in a bed at one time, we didn't have a parlor because that had to be the bedroom." Henry Fishman working at a cobbler shop (The Roxbury Eagle Shoe Repair Shop) in the 1920s. Our family started in Mattapan and moved up across from Franklin Park and then we moved down near Quincy Street in Roxbury, and then we moved back up towards Grove Hall, we moved quite often. I remember sleeping three in a bed at one time, we didn't have a parlor because that had to be the bedroom. When we were living in Boston my father was always a cobbler. Before he learned English they'd come in to tell him to do the shoes and they'd have to talk in sign language. He eventually had his own shop but I guess he didn't do so well, in other words, off and on he worked at his shop and other people's shops. He didn't work on Saturday or Sunday. He was either working or Saturdays he'd be at the shul, or I guess he played cards. But I knew when I came home my mother would be there, she was always home. She was always cooking and I guess she must have done sewing. Washing diapers, washing clothes, I remember a big copper pot on the wood stove and it'd always be heating and clothes and diapers would always be going in there and then we'd hang them out the window, they'd have those long lines with pulleys reaching across the way. We had an ice box. It was quite a deal. "When we were living in Boston my father was always a cobbler. Before he learned English they'd come in to tell him to do the shoes and they'd have to talk in sign language." "Because I was in the service they said 'Oh, you can get married in three days.' It was just us two, a rabbi, and two witnesses." 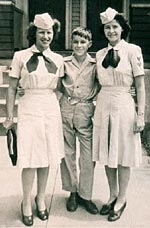 Sarah and Sylvia Fishman in their Coast Guard uniforms, with brother Milty, c. 1945. How did I meet Zadie? When I was nine years old they sent me to this camp run by some Jewish organizations in Beverly. They took kids who were undernourished--although my mother fed us very well. I met Lillian Katler there and we must have exchanged addresses because she showed up on my doorstep one day and we became close friends. She had three brothers who were never around so she was like an only child. One day when we were in our teens, her brother Leo was between girls, so he drove us to the party! At the time I was going to Bridgewater State Teachers College. The funniest part was I was the only one besides Uncle Ruby who went to college. We didn't have any money, Bridgewater was $75 a semester, so I couldn't afford to go. But my history teacher saw that I got all As and she suggested I go. I think Ruby paid. I had to travel by train, I did baby-sitting and I was able to pay for the books. Basically I studied English and French. When I got out of college I went to work in the Navy Yard. I don't think I was cut out to be a teacher anyway, but that's all girls were offered in those days. I was making mattress covers for the servicemen. While I was there I corresponded with a friend of mine who had gone into the Coast Guard. She came from a very religious Orthodox family, so if she could do it, so could I. I already had three brothers in the Army and one in the Navy. I liked the Coast Guard, I was down in Palm Beach for six months and then I went to the Coast Guard Academy in New London, Connecticut (see note 1). Women had to live off base. I worked in the office, the commissary store, where people went to buy meats. But I couldn't buy meats there, I had to find the only Jewish butcher shop (see note 2). You gotta remember when I was down Palm Beach, I was one of the few Jewish girls in the whole place. They called the coast guard the Hooligan Navy, because it was mostly Irish. But you know, when you're in the Coast Guard they treated you nice. 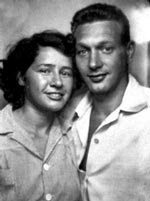 Sylvia and Leon Katler, 1944. That's when Zadie Katler, he worked for the state of Massachusetts and the federal government, he was on his way to California. We were writing to each other though we weren't engaged or anything. When I was in Florida he sent me a friendship ring, but I know he was dating other girls. And he was in no position to get married, there was a war going on. But we decided to get married and it was so easy, we went down to apply for a license, we took our blood tests, and because I was in the service they said "Oh, you can get married in three days." It was just us two, a rabbi, and two witnesses. That was August 1944 and the war was still going strong. Meanwhile they wouldn't let me transfer to California so he came back to New London. When I got out of the service, the unemployment office (I was collecting $20 a week) told me to go to the telephone company. But it was a known fact that they wouldn't hire a Jew there, and they didn't hire me! "I worked in the the commissary store, where people went to buy meats. But I couldn't buy meats there, I had to find the only Jewish butcher shop. You gotta remember when I was down Palm Beach, I was one of the few Jewish girls in the whole place." "Who had fun? I was taking care of babies, after Elissa I had Marshall, and then I had your father Paul." 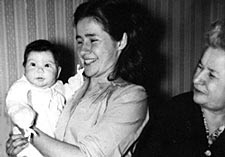 Three generations: baby Elissa with mother Sylvia and grandmother Mary in 1947. After the war we came back to Boston, as a matter of fact Zadie got a job before we came back. We decided it was time to have a baby and we had your Aunt Elissa. We lived in a coldwater flat in West End, across from the Charles River there. But it was a Jewish neighborhood, there were Jewish stores. We were able to get hot water from something, it was the oil burner for the stove. We had an ice box, they didn't have the right kind of electricity for refrigerators. The ice man would come around and we'd buy the ice, 15 cents for a block of ice. During the day I took care of Elissa, took her for walks, and I'd do my shopping or whatever. 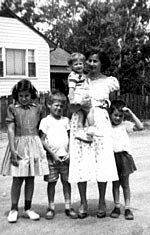 Sylvia with Elissa, Marshall, Marilyn & Paul in front of their house in Randolph, c. 1956. After a while my father finally was able to get us an apartment back in Roxbury. Unfortunately we spent a week having someone paint over the old wallpaper, and that was the week my mother died. She loved babies and all she wanted to do was take care of babies but she had a major heart attack. She was going to come and sit at the house and look at the baby here. I was so looking forward to it, and she really loved babies. When Leo's mother, Bobie Katler, held Elissa she would cry. But my mother had a way with babies. What did we do for fun? Who had fun? I was taking care of babies, after Elissa I had Marshall, and then I had your father Paul. I couldn't let the kids out in the yard alone, I had to wait after lunch and we'd all walk to the park. And that's why we moved to Randolph. We moved here when Paul was six months old and Zadie was working at the MBTA. They needed someone to do a better job, he made all of $80 a week, they raised his salary to $90 a week but they lowered it again and he got mad and quit. So he went to work somewhere else. "She loved babies, and all she wanted to do was take care of babies, but she had a major heart attack. She was going to come and sit at the house and look at the baby here. I was so looking forward to it." "Your Zadie was never religious, I don't know if you call him a radical or what. But he knew that Jews had to have something." Zadie was never too orthodox. His father wasn't a communist but he was antireligious, although his mother kept a semi-orthodox life. As we got older we got less religious, like in Palm Beach in the cafeteria when we sat down, I was eating this sliced white turkey and I said, "Gee that tastes funny." The girl next to me said "That's pork!" When I moved to Randolph there were no kosher butchers here, I had to learn how to buy from the supermarket, I learned to buy meat from the shops that weren't kosher. Some of it was the same kind of meat but they called it different names. Like my mother used to make shoulder steak, and I found out London Broil was shoulder steak. Zadie (Leon) Katler was the first president of Temple Beth Am, and its first member of the month, 1959. Before we moved to Randolph, there had been only two Jewish doctors, a builder, and a couple of lawyers. We asked the builder "Are there any Jewish people here?" And we didn't trust him, so Zadie Katler walked up the street and stopped a guy and said "Are there any Jewish people here?" And the guy said "What does it matter? What's wrong with Jews?" He must have thought Zadie didn't like Jews! When the Christian family next door moved out, a Jewish family who wanted to move in saw the name "Katler," and she thought that looked Jewish, so she called me and said "I wanted to know if there were any Jewish families in the neighborhood?" We had one neighbor who was terribly anti-semitic, but other than her it was a nice neighborhood. A year later there were about twenty Jewish families, so Zadie wanted to start a community center. We met in a basement, and that's when they elected Zadie as the first president. We didn't really do much praying, it was more or less getting together. But then the lawyer from the group went downtown to get a license from the state and said we would call it Temple Beth Am because if it was just a community center it wasn't nonprofit. Your Zadie was really interested in the youth, he started the Boy Scouts, the Girl Scouts, he was the youth director for years. He was never religious, I don't know if you call him a radical or what. But he knew that Jews had to have something. Basically he wanted a community center but he went along with the temple. And years later, he was always frustrated with the rabbi anyway, and the rabbi didn't want a new community center, he was afraid it would take money for the temple. That was the end of it for Zadie. Finally he decided to teach at Northeastern University nights, and he stopped going to the temple. Someone else took over the youth groups and they started going downhill after that. "In the cafeteria when we sat down, I was eating this sliced white turkey and I said, 'Gee that tastes funny.' The girl next to me said 'That's pork!'" "My neighbor up the street said she couldn't stand me sitting around the house. She made an appointment and got me a job at the state department of education." I got my Masters degree in Education at Bridgewater when Marilyn was an infant, I went evenings and sometimes Saturdays. It took me a few years. I went evenings so Zadie could baby-sit. After that I decided to take Russian at Northeastern and I got it free because it was an extension course run by the state and I was a veteran. And then I took it for two years at Northeastern, but that was the only Russian they had, so I went to the Harvard Extension School. It was a little difficult for me, maybe I went two years and quit in the third year. The second year, my former teacher from Northeastern was in the same class as me learning more Russian! I had first taken Russian in the service. I didn't have much to do and the school there allowed us to take courses for free--during the war we were friends with Russia. So I figured what the heck, I might as well take Russian at Northeastern. When did I start teaching? Your father was in high school at the time, he was very annoyed, he didn't like me teaching. Let's say he was 16. I was teaching French at Avon, but it was too much. I hadn't kept up with it. They were desperate because the fellow who taught French was drafted into the Vietnam War. So I went crazy, it was a new system, they used tapes which I had never done. I survived barely, and they wanted to hire me for English and I said "Forget it!" I had been a housewife too long. But a few years later I went to work for the City of Boston. My kids were all taken care of, they were all finished with school. And my neighbor up the street said she couldn't stand me sitting around the house. She made an appointment and got me a job at the state department of education. I could barely do it, I didn't know how to use the electric typewriters. I worked there a year or two years, I was getting frustrated and I wanted to become permanent. So then I got an offer to work for the school committee in the food service department. I guess you call it a secretary, I took up contracts and bills. "I survived barely, and they wanted to hire me for English and I said 'Forget it!' I had been a housewife too long." "I like to e-mail with my friends, the ones I used to work with, and the relatives. Grocery places send me online coupons. You name it, I've got it. 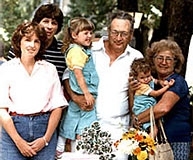 Bobie (far right) holding my sister with my mother, my father, me, and Zadie c. 1984. When Zadie decided to retire I worked another year or so and then I decided it was time to retire, I think it was 1984. We didn't do anything especially exciting, we hung around a lot, played with the computer. 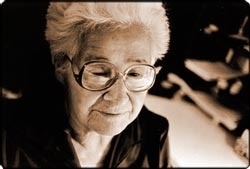 Now our first computer was an Apple II+, and it was because Zadie worked at Northeastern. He was one of the few teachers who really taught them how to use the computer, he made up his own programs and everything. We never had an Apple IIe, we went from the II+ to the IIgs. The Apple II+ only worked in capital letters, so when I went from learning to program BASIC to learning C, that's why we got the IIgs. Zadie and Bobie at my high school graduation party in 1998. We had that for a long time, and then your father talked us into a Mac, I think we had a Quadra. Marshall took that one. And then we had that other one that your father took because it crashed. Now I have a Macintosh G4. I almost get a heart attack when it freezes, because you have to put the monitor on and put the computer on, and of course the pointer is connected to the surge protector so if you don't put it on it freezes. Every once in a while I'm careless and I forget to put it on. I go to all kinds of websites, mostly pictures, clip art, cards, but I also do tax forms. Today Jerry Druckman, he's a cousin of Zadie Katler's, he asked me to look up the Better Business Bureau because he signed up for a cruise, and before he gave them money he wanted to make sure they were a good company. I like to e-mail with my friends, the ones I used to work with, and the relatives. Grocery places send me online coupons. You name it, I've got it. Bobie at her computer on Rosh Hoshanah, 2000. "I decided it was time to retire, I think it was 1984. We didn't do anything especially exciting, we hung around a lot, played with the computer."